Corruption scandals and neoliberal economic policies have weakened the Workers' Party government in Brazil. 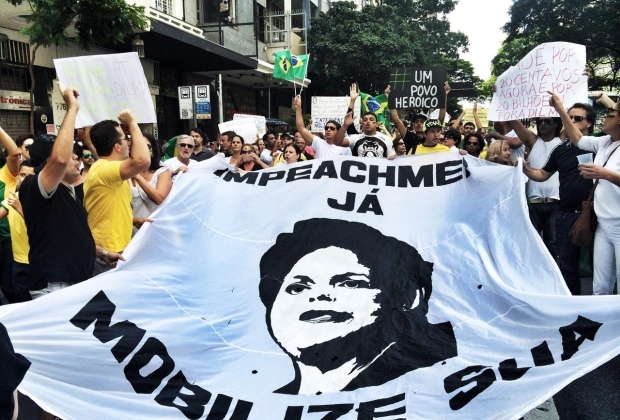 On August 16, for the third time in six months, the Brazilian right took to the streets across the country, denouncing political corruption and demanding the impeachment of Brazilian President Dilma Rousseff of the Workers’ Party (PT). The demonstrations reflect the Brazilian right’s growing confidence, a product of the deep political crisis of the PT government, which has ruled Brazil since 2003. Corruption by elected officials and functionaries in the PT, as well as its adoption of neoliberal policies, has strengthened the right-wing opposition and severely demoralized PT supporters, allowing the Right to largely set the political agenda. While it is essential for progressives to understand and oppose the reactionary movements calling for the impeachment of a democratically elected president, it is equally crucial to analyze the PT’s own offensive against its working-class base. A left-wing solution to the political and economic crisis entails taking a stand against both the reactionary impeachment movements and the anti-worker policies of the PT federal government. Currently embroiled in a wide-ranging corruption scandal in the state oil company, Petrobras, and at the helm amid a deep economic recession, the PT government has turned its back on the party’s traditional popular, union, and social movement base, opting to strike a deal with power brokers in allied political parties to save the government in return for a series of pro-business and anti-labor measures. Rather than weakening the right wing, such policies have fueled the pro-impeachment movements. The conservative parties have been able to push through laws in the opposition-controlled Congress extending outsourcing and precarious labor contracts and expanding the private financing of political campaigns. While the August 16 protests were smaller and less spirited than the first massive mobilizations earlier this year — in March, 210,000 marched in São Paulo — 135,000 still turned out in Brazil’s largest city, and Rio de Janeiro, Brasília, Belo Horizonte, Porto Alegre, and other state capitals witnessed demonstrations in the tens of thousands. The huge numbers are not necessarily an indication that the right wing is growing. But they are still expressive of a sizable and organized opposition movement, and of a willingness to mobilize for the first time since the “popular” demonstrations that preceded the military coup in 1964. In reaction to the August 16 mobilization, there was a national counter-demonstration on August 20 endorsed by the PT and organized by the large homeless workers movement (MTST), the main trade union central (CUT), the militant trade union central (Intersindical), the left-wing opposition party PSOL, and other social movements. While the demonstrations in most cities were small, more than 50,000 people marched in São Paulo. With a mix of pro-government slogans, speeches, and banners (from CUT, PT, and supporters from allied parties) and staunch criticisms of Rousseff’s social program cuts (by the MTST, PSOL, and independent trade union militants), the march demonstrated the deep contradictions of the Brazilian left and social movements in the context of an economic crisis, an emboldened right, and a supposedly pro-labor party in power. As with the March and April demonstrations, those at the August 16 right-wing rally in São Paulo were overwhelmingly white and middle class. Polls coordinated by the social scientists Pablo Ortellado, Esther Solano, and Lucia Nader found that 65 percent had completed university education, 73 percent were white (in a country where 50 percent of the population is black or mixed-race), and 70 percent had middle- or upper-middle-class income levels. While impeaching the president and opposing Petrobras corruption were the protesters’ main concerns, the survey also revealed the social conservatism of the participants: the vast majority opposed racial quotas and the legalization of marijuana and supported tougher anti-crime measures, including lowering the age of criminal responsibility. Also present at every protest since March have been small, but visible, contingents of the far right — monarchists, racist skinheads, and organizations calling for military intervention. Individual counter-protesters and journalists were physically assaulted at the March and August demonstrations. And at the August demo in Rio, protesters mistook a black street cleaner for a government supporter and subjected him to racist vitriol. Not surprisingly, police have treated right-wing demonstrators much more favorably than their left-wing counterparts. At these rallies, many protesters take selfies with police officers — in striking contrast to the usually brutal handling of leftist protesters by security forces. This was particularly despicable in the case of the August 16 protest, since a police death squad had assassinated nineteen innocent people in two poor suburban cities in Greater São Paulo just two days earlier. On questions of social rights, the demonstrators generally ape the main opposition parties’ positions. Yet when it comes to social programs, they diverge from the neoliberal politics of these parties and the main protest organizers. In the same poll of August 16 participants, a staggering 96–97 percent supported free universal healthcare, and 97–98 percent favored free universal public education. Half supported free public transit services. And a majority opposed private financing of political campaigns, a clear repudiation of a recent bill anti-government parties pushed through Congress. While the focus was clearly on PT corruption, participants were also extremely critical of unscrupulous politicians in the opposition parties. These results seem to indicate that there’s support for decent social services — the focus of the 2013 left-wing demonstrations — among the right wing’s rank-and-file, even if the conservative parties and rally organizers clearly wish to gut the welfare state. They also suggest that, despite this apparent incongruity, the leadership of right-wing movements have been able to galvanize and redirect dissatisfaction over social programs and political representation into a general anti-corruption campaign against the PT government. So who’s behind the recent mobilizations? Three groups, all of which share a free-market philosophy summed by the placard “More Mises, Less Marx”: Vem Pra Rua (Come to the Streets), Movimento Brasil Livre (Free Brazil Movement), and Revoltados Online (Online Revolted). Ironically inspired by the grassroots and non-party nature of the June 2013 movement — which arose out of protests against transit fare increases — these right-wing groups are largely funded by small contributions from supporters and the sale of t-shirts and paraphernalia. There is also evidence that they have received significant donations from wealthy businessmen linked to free-market think tanks. While all three insist that they are not aligned with the traditional political system, several of the main organizers have historic ties to political parties with long records of corruption. Indeed, scores of politicians who have served prison time for corruption or are currently facing corruption charges — and even some implicated in the Petrobras scandal — participated in the demonstrations. In addition, numerous figures from political parties have shown up to speak at the demonstrations. The leader of the main opposition party, the Brazilian Social Democratic Party (PSDB), was the featured speaker in Belo Horizonte. And former President Fernando Henrique Cardoso, a PSDB member, also enjoined Rousseff to step down. The mobilized right has enjoyed almost uniformly favorable coverage from the mass media. The main private television networks and newspapers openly promoted all three demonstrations this year and amplified their calls for impeachment. Globo, the main television network is the major exception, breaking ranks in August to support the deal hatched by the PT government and the centrist parties to avoid impeachment. A Globo television crew was even physically expelled from the August demonstration in Rio. Rousseff’s government would be facing stormy weather even without a stronger right — and much of the trouble is self-inflicted. The PT’s tradition of being the “ethical” party that favored working people has been forever tarnished by the involvement of key party leaders in bribery and influence-peddling schemes. The Petrobras imbroglio comes on the heels of the 2005 campaign-financing scandal that led to jail time for several leading PT members. That ex-government ministers and founding members of the party have left politics to become multi-millionaire political consultants has only deepened the sense that the Workers’ Party is no longer a party of the Left. While the other main parties are neck-deep in corruption too, they have largely succeeded in avoiding scrutiny. The mass media, which only reluctantly accepted the PT governments of the last decade, has singularly focused on the PT, downplaying the venality that is rife in all conventional Brazilian parties. This is doubly ironic since the major media outlets have received billions in financial licenses and publicity contracts from federal government coffers since the PT was first elected in 2002. Yet what has harmed the PT most — and what has effectively fueled the resurgence of conservative movements — is its embrace of a neoliberal economic and political agenda. During the economic boom in Brazil from 2002 to 2012, the PT government was able to advance modest social reforms while maintaining an orthodox financial policy that benefitted financial and agro-industrial capital. As historian Lincoln Secco argues, the PT ceded hegemony to the “ideologues of the financial markets” after taking power. A robust world climate for an economy based on agricultural and mineral exports allowed the government to pay off most of its international debt and increase living standards for the poorest Brazilians through focused assistance programs, even while the rich benefitted disproportionately. Alliances with a range of centrist and right-wing parties, many of them with links to the 1964–1985 military dictatorship, allowed the PT to advance part of its agenda despite the opposition’s control of Congress. But when the world economic crisis reached the country in 2011–12, the government completely embraced neoliberalism. Continuing its two-decade transformation into a Third Way social-democratic party, the PT has cut social programs and labor rights while maintaining the disastrous high-interest-rate policy and financial orthodoxy so desired by the banking sector. Interest rates are among the steepest in the world, and almost half of government receipts are used to pay off a national debt that is now held largely by Brazilian banks. While inflation and unemployment are growing and wages are being compressed, the policies are paying off for the country’s financial sector. According to the International Monetary Fund, the profits of Brazil’s four largest banks in 2013 were larger than the GDP of eighty-three countries. After a hard-fought reelection campaign in November 2014, whose success depended on the last-minute mobilization of the PT’s working-class and popular base, Rousseff appointed an ex-banker as minister of finance whose first policy was a package of massive cuts to education, health care, housing, and urban services. On social policy, the limited initiatives of Rousseff’s predecessor, PT founder Luiz Inácio Lula da Silva, have been stalled or reversed. Despite the Landless Rural Workers’ Movement’s support for the government, land settlement policies for landless workers have also declined precipitously under PT governments. By the same token, the federal government has significantly reduced the demarcation of lands for indigenous peoples, a majority of whom live in abject poverty. And the appointment of a reactionary agro-industrialist as minister of agriculture has been widely seen as a slap in the face to rural workers and indigenous rights movements. In addition, the PT recently bolstered the security state with an “anti-terrorism” bill that threatens to stifle social movements. This is a clear setback for a country with a tradition of authoritarianism and a brutal police force that routinely attacks demonstrators and murders blacks and the poor in the big cities’ peripheries. Between 2009 and 2013, Brazilian police forces killed an average of six people per day, making it one of the most violent in the world. In reaction to the growing impeachment mobilizations, the PT government has only timidly called for its base to mobilize against the Right, preferring to stitch together a backroom deal with allied parties in the Senate, the mass media, and, crucially, key representatives of the ruling class. Because political crises are not conducive to a positive business climate, the representatives of big capital — the São Paulo and Rio associations of industry and the national agro-business association — have urged for a political solution that avoids impeachment. Likewise, the big banks do not want any political instability that will threaten their record profits. In early August, the leader of the Senate, Renan Calheiros, long known for corruption and pork-belly practices, offered the government his support in return for a package of neoliberal policies that expand contracting, reduce environmental regulations, and make it easier for businesses to skirt labor laws. Rousseff immediately accepted the offer. Left-wing opposition to the Right and the PT government is both necessary and fraught with challenges. While the militant homeless activists of the MTST and sections of PSOL participated in the August 20 demonstrations in favor of democracy and against the Right, the radical left, including autonomous movements, militant trade unionists, and many tendencies within PSOL publicly repudiated rallies that solely defended Rousseff against impeachment. The original meeting for the national demonstrations focused on opposition to the government’s neoliberal politics, but PT supporters attempted to twist them into a shameless defense of the government. Nevertheless, in five cities, including Rio de Janeiro, the MTST and the left opposition organized demonstrations separate from those of PT supporters. Even at the biggest demo, in São Paulo, opposition to the PT’s policies was highly visible despite the predominate number of PT government supporters. In the short term, the anti-government left must organize opposition to the deal between the PT and the centrist parties, which will only bring more austerity. There’s already some action on this front. The MTST has promised to launch massive demonstrations if the government defaults on its promises to boost public housing programs. And the two left-wing trade union centrals — Conlutas and Intersindical — are stepping up their support for the public- and private-sector strike actions that are multiplying across the country. In the medium and long term, Brazil needs a robust, united left firmly rooted in working-class power. Despite significant obstacles, building social movements and unions against the Right and the PT government is the only way to defend social programs and labor rights. Corruption scandals and neoliberal economic policies have weakened the Workers’ Party government in Brazil.